Chartreux cats are known for their beautiful blue-gray, woolly, medium length coat. Indeed, the Chartreux's fur is quite unique: it is double-coated, nappy, water resistant, and very similar to sheep's wool. 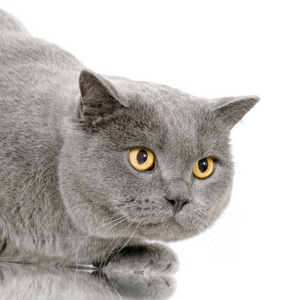 The Chartreux cat has a muscular, robust body, a wide chest and medium to short legs. These lovely kitties have a round face and seem to always be smiling. Their eye color varies from gold to copper. Overall, the Chartreux is a very healthy cat. Many experts believe that the breed (as we know it today) originated in France. But the exact origins of the Chartreux are not known. The roots of this "blue" kitty are steeped in mystery. One legend says that the Chartreux is a descendant of feral Syrian cats, which were brought to Europe by the crusaders in the 13th century. Another legend suggests that the ancestors of this breed were brought to France by Carthusian monks (incidentally, some crusaders became Carthusian monks). These cats lived in the order's monastery, known as the Grande Chartreuse. This monastery was located in the Chartreuse Mountains, located to the north of the city of Grenoble. Some believe that the breed's name is derived from the monastery's name. By the way, another theory says that Chartreux was the name of a very popular Spanish wool during the 18th century. So they believe the Chartreux was given that name because of its woolly coat. Now, back to this beautiful breed's origins. Even though the legend of the Carthusian monks is a popular one, there is no hard evidence that such cats were similar in appearance to the Chartreux or that the Chartreux descended from those early cats. One things is certain, though. The Chartreux appears in documents as early as the 17th century. In fact, the breed is mentioned by French naturalist Georges-Louis Leclerc, Comte de Buffon. This shows that this lovely feline has been around for some time. Despite its long history; however, the Chartreux was accepted for competition by the CFA until 1987. The breed is also recognized by the following cat registries: AACE, CFA, ACFA, CCA, ACF, TICA, and FIFe. Chartreux are quiet cats. So don't expect to have too many conversations with a Chartreux. They rarely meow or cry. These blue cats; however, are extremely affectionate and loyal. Indeed, they tend to bond with one member of the family. Some owners say that they behave like dogs and that they follow them from room to room. Chartreux take two years (on average) to reach adulthood. And they remain playful way into their adult years. Chartreux are very smart and can easily learn tricks like opening doors, fetching things and even turning the radio on! These gray cats are also very agile and are great hunters. It is no wonder that they were very popular among French farmers. What's in a name? The first letter of the official name of a Chartreux cat is related to the year of the cat's birth. So the names of all Chartreux cats born in the same year will start with the same letter. The first Chartreux arrived in the US in 1971. The first Chartreux brought to the US came from the French countryside. Even though they are relatively a "new breed" in the US, these felines are growing more and more popular. And their renown is quite understandable: these lovely grey cats are not only beautiful, but they also have a unique history and a certain mystique.